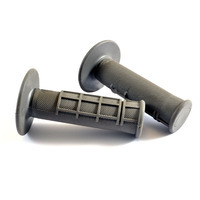 Pit Bike Grips These pit bike handle bar grey grips are a standard fit for all pit bikes Made from a dual compound these grips are durable and hard wearing The raised diamond waffle surface allows for ultimate grip and excellent comfort as well as minimum mud retention and shock absorption Our pit bike grips will suit every riding condition and riding style These grips are supplied in a neutral colour of grey to ensure no matter what bike you may have these grips will keep in line with your colour scheme. A cheap and cheerful replacement for your originals A must have spare Summary. Universal 22mm diameter handle bar fitment.